The Hong Kong ICT Awards 2011: Best Lifestyle Awards launching ceremony was organised by the Hong Kong Information Technology Federation (HKITF) and supported by the Office of the Government Chief Information Officer (OGCIO), the Hong Kong Productivity Council (HKPC) and the Hong Kong Trade Development Council (HKTDC). The launch was officiated today at 4pm in Ocean Terminal, Harbour City, Tsim Sha Tsui. 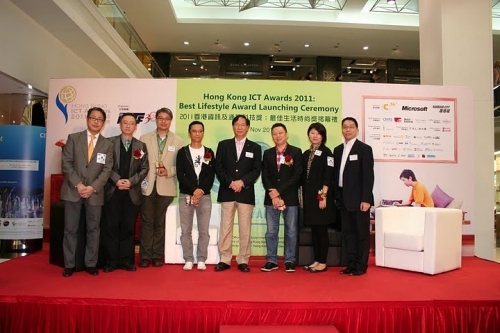 The Hong Kong ICT Awards 2011 is one of the most prestigious information and communications technology awards that recognises, promotes and commends the excellent achievements of Hong Kong ICT professionals and organizations. There are ten different categories of ICT awards and the Best Lifestyle Awards is one of them. Three award streams are under the Best Lifestyle Awards category and they are: “Green, Healthy and Creative Living”, “Learning and Living” and “Social Community”. It is expected there will be many high caliber applications for the awards this year. On this year’s officiating guest list there is Mr. Albert Jinghan CHENG, JP, Chief Judge of the Award and Chairman of Wave Media Limited, Mr. Ricky Wai- kay Wong, Chairman of CTI Telecom Limited, Dr William Wing-Yan LO, JP, Mr. Erwin Steve HUANG, Deputy Chairman of TSL Jewellery and Convener of the eLearning Consortium, Mr. Francis Po-Kiu FONG, President of HKITF and Ms. Winnie Yeung, Chairwoman of the Organizing Committee of the Award. The president of HKITF, Mr. Francis Fong said in his officiating speech that: “ HKITF is proud to be the leading organizer again this year for the award category on “Best Lifestyle” for the third time in a row. We are expecting more applications for 2011 intake than in previous years. Undoubtedly, technology plays an important role in every sphere of life. It has changed our business life, our home life and our relationships with others. It has also affected us in regards to education. The competition not only brings honor and prestige to the ICT community for their distinguished achievement and professional endeavor, and also promote the innovative use of ICT technology for the betterment of life. Chairwoman of the Organizing Committee of the Awards, Ms. Winnie Yeung remarked during her introduction of the Award that: “This year we re- arranged the three award streams to match growing interest of the community. During today’s launch event, Mr. Albert Cheng, GBS, JP, Hong Kong’s most popular talk-show host, ran a section of “Digital News Tease (數碼龍門陣)” and chatted with other celebrity guests including Mr. Ricky Wong, Dr. William Lo, JP and Mr. Erwin Huang. Mr. Huang is best known for his participation in the RTHK reality show “Millionaires Fight Poverty”. The guests enjoyed coffee and had chit-chats how they saw ICT and lifestyle trends. In addition, some local renowned bloggers were invited to share their favourite technology gadgets and tips on how to use technology to enhance lifestyle with the general public.